Rotolo is one of my favorite pasta dishes! What is it? It is a rolled and filled pasta dish baked to glorious deliciousness…. Basically. So the holidays are upon us and I may still have a little Thanksgiving hangover. Thinking about the next holiday feast this month the idea of basically having the same food does not appeal to me… so I thought out of the box. If your family, friends or group are open to inviting new people to join in on holiday gatherings, there is always that ONE person that brings something not traditional. James Siderias I’m thinking about you. I LOVE that one person. By that person bringing a dish that your tribe has not seen either AT ALL or. during the holidays, has always been my favorite person…. But only if it’s tasty. Rotolo is that ONE dish you can bring that’s totally separate from the Holiday Lunch Box. Fill it with whatever you want: Ricotta and Spinach, Chopped chicken and Artichoke, Mozzarella cheese and fresh basil! It’s not what you fill it with that makes Rotolo it’s the homemade pasta rolled out thin, filled, rolled (thus Rotolo), and baked that makes it a Rotolo. So this is my version… differently made and cooked than some, but MINE… and I am keeping it. Hope you enjoy! 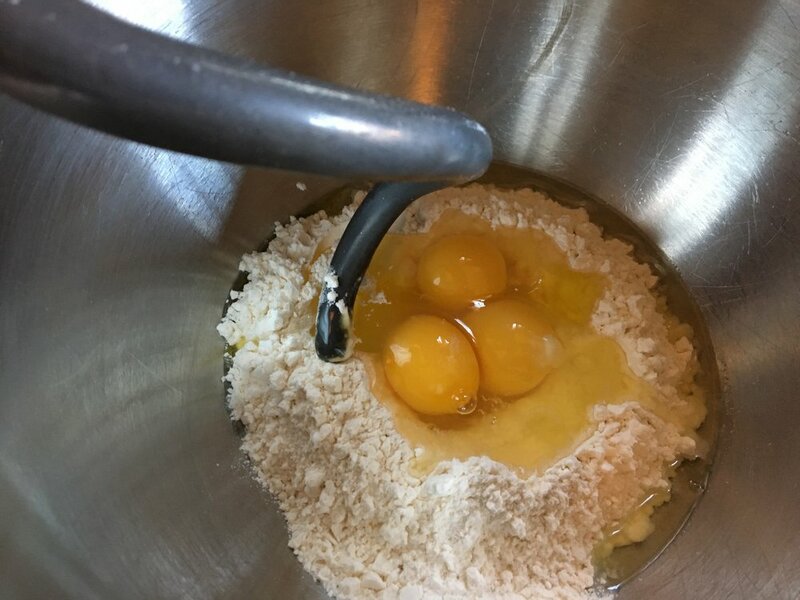 In Your stand mixer with the dough hook, add the flour and salt/ Create a well in the center and crack in the eggs one at a time into the center of the well. Add the olive oil and turn the mixer on at a slow setting. Once the eggs are broken up, increases the speed to the point the flour is slowly coming into the well and forming a pasta dough. You may have to stop the mixer and knock the flour in from the sides for it to combine. Let the mixer knead the dough until it has “cleaned” the mixing bowl about 3-5 minutes depending on the speed you have the mixer set. Remove the nice satiny ball of dough, wrap it in plastic wrap handset aside to rest. Making the homemade marinara with Red Gold Tomatoes. In a heavy bottom pot begin heating a few glugs of olive oil to cook/“sweat” your onions and garlic along with the Cook’s Line Seasoning. Add the onions and garlic to the pot and cook until tender. Add the two cans of whole peeled tomatoes with the juice and crush with your clean hands. You may also use a potato masher to crush the tomatoes without your hands. Clearly, I like playing with my food. Add the dried basil and red wine. Cover and cook on low for around 45 minutes or until the chunky, flavorful marinara is to the consistency of your liking. Taste for seasoning. In a sauce pot begin slowly melting your butter. Add the flour and mix in…cooking the roux to a nice golden color and the frothing from the butter has subsided. With your handy whisk... whisking, slowly add the warmed milk. Be sure to mix around the bottom “sides” of the sauce pot to bring in any of the roux that may be hiding. Add in the ground nutmeg and season to taste with Cook’s Line or salt and pepper. Cook until the sauce is thick and bubbly. Pour into a separate bowl and add plastic wrap directly on top of the sauce (no the plastic will not melt) to prevent air from getting to it and forming a skin. Set aside to cool. Preheat your oven to 375 degrees. On a lightly floured surface roll your pasta out into a rectangle, or as close as you can get it. You will square it off with a knife before rolling anyway. Roll the dough out thin enough to see your hand behind it. Add the béchamel sauce the center of the rectangle and befogs smoothing not out to the ages with a metal spatula. Lay out the thinly sliced ham followed up with the blanched asparagus. Top with shaved parmesan for added flavor. Rolling from the bottom up, carefully and as evenly as you can begin rolling the dough. Stop to adjust evenness and tightness of your roll if needed (Sounds like a good metaphor for life as well). Roll to the top. With a sharp knife begin cutting slices of your Rotolo, about 2” thick. Oil the bottom and sides of a casserole dish and lay in the Rotolo careful not to overcrowd them. From the sides of the casserole dish Pour in the chicken stock. Move the dish around to be sure the chicken stock is evenly distributed. Cover with aluminum foil and bake in the oven for 25 minutes. Remove the dish from the oven and uncover. Dot the top of the Rotolo with your homemade chunky marinara sauce. Raise the oven to 400 degrees and place the dish back into the oven for an additional 25 minutes. Remove the golden bubbly Rotolo and allow it to rest for five minutes. Serve it on up when you can't stand the wait any longer!